There are only a few electric mountain bikes on the market, but electric motors can certainly assist with off-road riding. You can also build you own electric mountain bike by installing an electric motor kit onto an existing mountain bike. There’s also the Biontague, which is a mountain bike that has a electric kit pre-installed. The best value for an electric mountain bike is the E-Zip Mountain Trailz Electric Bicycle, made by Currie Technologies. I’ve found that the range of a fully-charged battery is about 20 miles — that’s if you make liberal use of the electric assist. 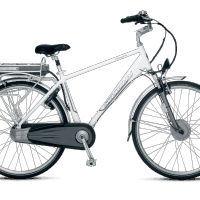 If you just use it to go up hills, the charge will last for about 30 miles. You can also add a second battery for $120 from Currie Technologies, that will double your range (but it will also increase the bike’s weight). It’s available from Amazon for $368. The Liberty Stealth Climber Mountain Bike is sold by Liberty Bikes in Pennslyvania. This bike has a 450 watt 36V motor and it’s powered by a lithium-ion battery. Electric-assist is engaged with a throttle, and motor will get you up to 18 mph. If you want to go faster than this, you can provide further pedal power using the 6 speed gears. Weighing only 68 pounds, this mountain bike comes with our front and rear disk break systems. It also has built-in shock absorbers, and front and rear lights. Charging time is 4-6 hours, and the range is 20-27 miles. The bike is priced at $1275, but it looks like its being sold on eBay for $900. Got myself a Cyclamatic Power Plus CX1, let me tell you.. it’s the best buy I’ve made in years. For $600 it sounds a bit too good to be true, well this time it really is, had it for a few months now and I’m thrilled every time I get on it. I think this benefit is the most important and significant one. And last but not the least, your electric bicycles are not for drag racing. If you’re using a rear mounted electric motor, you’ll want to be very careful to align the chain properly, very straight and without a lot of slack. I have one of these bikes. It’s Made in China Garbage. After about 3 weeks of riding flat streets, all back tier Spokes became dangerously loose where my tire almost literally fell apart while riding in a busy street. It can barely make it up a very small incline, never mind a mountain. I spent way to much money on this with shipping and all , from liberty, and they were a week and half late with delivery. No customer service, they stopped answering the phones after I asked if it was made in china. Terrible all around. Saved as a favorite, І likе youг blog! I have an electric mountain bike I built myself and my advise would be: For anybody trying to go off-road with their bike, I would recommend a motor 500w to 750w. Anything smaller than this won’t have the power to push you up steep hills. Also, the standard battery advertised as 20 miles range (10 or 12ah battery) won’t last more than 15 miles in a rough terrain, so go with the upgrade or get a 20ah battery to have at least 30 mile range on your bike. Here is a short video of me riding a bike in Anza Borrego Desert. I built it with a conversion kit for $800. 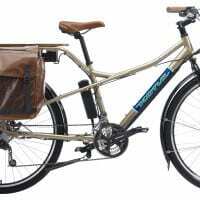 Good evaluation of electric bikes. Awesome website. I teach Energy Policy at the University of Nevada in Reno and will recommend your website as a resource site for students writing papers on energy efficiency. Everyone talks today about alternative energy, especially solar thermal and photovoltaic here in Nevada, but I tell students that the first steps are conservation and efficiency. Then and only then does it make sense to consider solar for power and hearing. Why buy an alternative energy source and then waste it on a home that leaks air like a sieve, has sustandard insulation, and inefficient appliances and electronics? The first photo in this blog entry is of a bike mounted with a Bionx e-bike kit, from http://www.bionx.ca. I have owned one of these for over two years (after giving up on the much older, noisier, heavier, and failure-prone Charger Electric Bicycle) and it is fabulous. My local bike store installed it on my hybrid bike and it made all the difference in my 22km (15 mile) commute to work. Before, I arrived back home after my 30 mile round trip exhausted and ready to go to bed (it’s hard to do 30 miles a day every day when you’re pushing 50). With the Bionx I would charge up overnight (cost: $0.04), bike to work, charge at work (employer’s cost: $0.04) and then bike home. And I was relaxed instead of exhausted on the return trip. They can be mounted on just about any bike. Not sure how many dealers carry them but they’re definitely a great e-bike kit to look into.